The MarCum ShowDown Troller 2.0 Digital Fish Finder has been newly upgraded, without even increasing the price. The vibrant new LCD provides sharp resolutions as it displays depth, fish, lures, and structure. The all new Auto Bottom Lock Zoom feature tracks and magnifies structure so you never miss a bottom-hugging fish again. 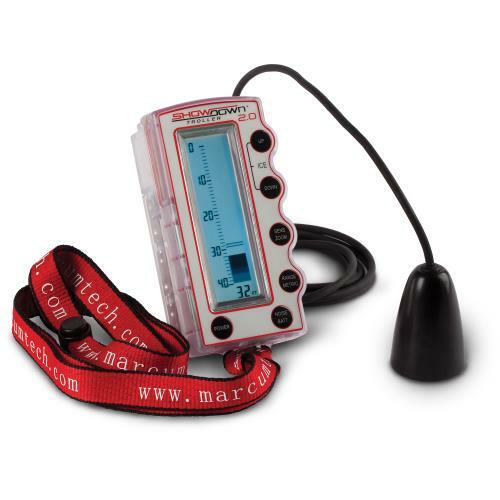 The MarCum ShowDown Troller 2.0 Digital Fish Finder has been newly upgraded, without even increasing the price. The vibrant new LCD provides sharp resolutions as it displays depth, fish, lures, and structure. The all new Auto Bottom Lock Zoom feature tracks and magnifies structure so you never miss a bottom-hugging fish again. The Showdown Troller 2.0 even includes a built-in LCD heater for use in extreme cold and an Auto Depth Scale function immediately locks onto depth, displaying targets and digital depth from 1 to 120-feet of water. Attached to a 20-degree transducer and 6-feet of cable, Troller provides instant fish-finding data. The ShowDown 2.0 Ice Troller can be powered with 6 AA batteries or 12-volt power. The MarCum ShowDown Troller 2.0 Digital Fish Finder is made in the U.S.A. Comments: I purchased the Showdown Troller 2.0 and on my first ice fishing outing I was ready to ship it back is was so disgusted. I came home reread the excellent reviews and figured I was not using it right. Rather than return the product I purchased the related Performance Pack. Wow what a difference. It outperformed my fishing buddies Vexilar and was more convenient and portable. You have to learn how to use this device but when you do it will perform higher than your expectations. You can see the movement of a water wiggler on a jig, see fish attack your bait, if you get really good you will see the 1/4 inch separation everyone talks about. It is very sensitive and you will need practice. Once you dial it in it is a fish machine. Comments: I am brand new to the use of flashers with ice fishing and I appreciate the ease of which I can run and gun from spot to spot with this product. I have purchased the performance pack plus 12v battery, which adds decent weight to the product, but truly find it still convenient to carry. After a quick read of the manual and some time in the simulator option, I was impressed how easy the unit was to use. My practical application on the ice taught me that I had to sometimes switch between the Noise and Sensitivity features to get a precise read, but after a little fine tuning, I was impressed at the accuracy. I had a minnow approximately 4 inches below 2 split shots, and the unit actually marked the space between the split shots and minnow, an accuracy beyond what I expected considering it was the cheaper of the Showdown models (Showdown 5.6 being the other). I am extremely happy with my Showdown 2.0, its ease of use and convenient adaptability. As I am in Canada, I won't discuss cost comparisons as it would be inaccurate but regardless of where you purchase it, I still say it is well worth the investment. Is an adapter available to connect the 2.0 to a 12 volt battery? Unfortunately FishUSA does not carry such an adapter, I would suggest contacting the manufacturer to see if they offer an adapter that will work for you. Does the 2.0 come with a case? That particular model does not come with a case. You would have to get one of the combo units.